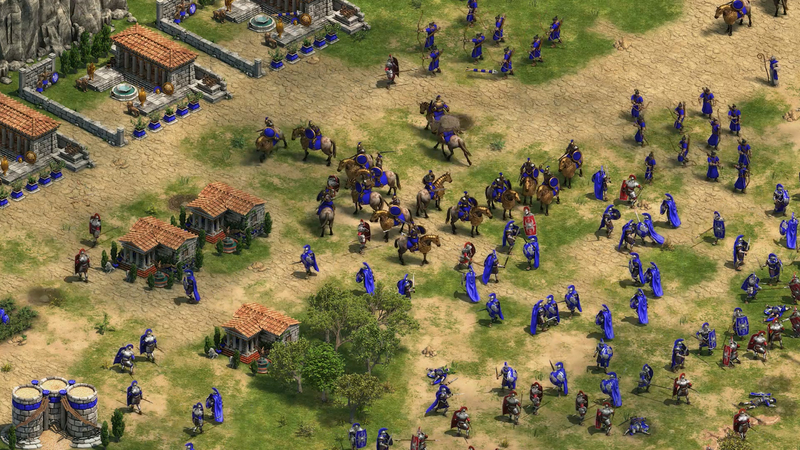 Age of Empires was a fundamental part of my RTS education. 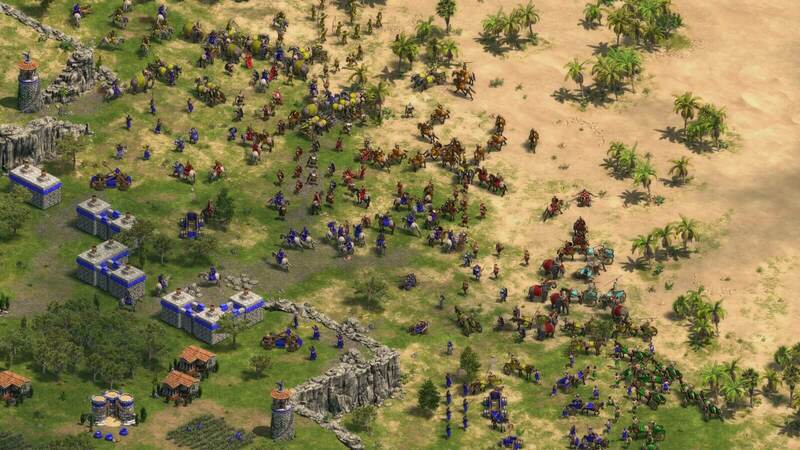 Two years before it I was enjoying the futurist spin of Command & Conquer and the fantasy vibes of Warcraft II, but Age of Empires offered up something else entirely -- a middle-ground. It was a monumental moment in the history of the genre, as the awe-inspiring sprite-work and the sheer scope of the game really spoke to me and spurred my interest in ancient civilizations. Age of Empires: Definitive Edition is still very much a game from the '90s, lacking the panache of its sucessors, but those of you with an open mind and a strategic knack will enjoy it just as I did all those years ago. Even though I haven't played in ages, all of my prior knowledge came flowing back through me as soon as I moused my cursor over my first worker. The Definitive Edition has a way about it that just feels right, to the point where I had to do a double-take and watch a video of the original just to see if I was going crazy. No, the 1997 edition never looked this good, and the remaster doesn't douse its legacy in any way. A tried and true skirmish-based RTS, the concept of a warring over a finite amount of resources that forces eventual confrontation isn't unique to Age of Empires, but it's handled a bit more organically in this series. With several forms of resource gathering (such as hunting and farming berries for food) you always feel like you have a strategic choice, rather than just setting and forgetting a bunch of drones to grab gold from a mine. Rising through the ages for upgrades at new tiers (an RTS staple) is gamey, sure, but it's engaging and framed as moving through major moments in history. Multiple win conditions like building and defending a Wonder to win are still magical and unique. Subtle enhancements that bring the original iteration into the modern era are welcome. Attack move (where units quite literally can attack while navigating if you press a qualifying button) is a no-brainer. So are all the included staples of old school RTS that are still relevant today -- multiple building orders, control groups, viewing idle villagers at a glance. Pathfinding (the process in which units locate areas you command them to go) is the only "improved" mechanic that still needs work. It'll all come naturally to folks who have moved on from Age of Empires and into more uncharted territory. The population limit increase is really the big draw here. While a lot of remasters fundamentally don't touch the base, Microsoft took a chance here and shook up the game while keeping in some tongue in cheek references. Ratcheting up a unit cap that served as a technical limitation doesn't sacrifice its strategic core, and it works particularly well with the expanded zoom feature -- whoever put in for that one deserves a raise. I was taking all this in with the tasteful animation alterations (mainly more stylish building destruction) and the orchestral soundtrack. The only aspect of the presentation that feels off is the UI -- which is so dated that it's like the team ran out of money to fix it up. What's going to be the big holdup, not only for power users but for posterity, is online play. It's very finicky even after its beta state, to the point where you really need to sort of go into this remaster knowing it's a single-player game. Despite the boisterous claim of dedicated servers for all on Xbox One, some PC releases are left in the dust, this one included. Remember all of those fun '90s ping issues you had? Well they're back, baby! Having tested out the multiplayer in the live version I ran into some of the same issues as the beta, where entire games would drop as a result of a connection error. Having to go through the Microsoft Store app, which significantly hinders my ability to play the game at times (I had to go through multiple processes to rid the app of boot errors), is also no fun. It's a good thing the campaign has basically been doubled in the Definitive Edition, and bots are still in. The Windows 10 restrictions simply do the development team a disservice. A lot of work went into Age of Empires: Definitive Edition and just enough tweaks were made to ensure that it's still relevant in 2018. I have an incredible amount of respect for the folks who brought this classic back to life, and for their restraint to ensure that this remaster doesn't abandon its roots.